Premium Compatible Label Tapes for the Brother P-Touch 550 printer. Brother P-Touch 550 is a state-of-the-art handheld labeller machine that stands out for having a host of advanced features and functions. It has been designed to suit both, office use as well as home use. One of the highlights of this device is that it can print text horizontally as well as vertically with equal ease. Another aspect of Brother P-Touch 550 that is bound to grab your attention is its special QWERTY keyboard. To print finest quality and durable labels with Brother P-Touch 550 Brother P-Touch 550 Label Tapes are highly recommended. The dimensions of Brother P-Touch 550 are 9.8 x 5 x 3.7 inches and its weight is 2.3 pounds. It is equipped to carry out advanced tasks like auto tape cutter function and even barcode printing, which broaden the choices you have to execute a variety of label printing tasks. When this device joins forces with Brother P-Touch 550 Label Tapes, the bar is raised automatically. Brother P-Touch 550 can print up to 7 lines on a 36mm tap, which is adequate for all applications. Brother P-Touch 550 may well be called a multi-lingual device as it can print in English, Spanish, French and Portuguese. Incorporating quality components like the Brother P-Touch 550 Label Tapes expedites intricate tasks as these label tapes are manufactured to support label printing jobs by Brother P-Touch 550. Brother P-Touch 550 can carry out an exceptional range of advanced functions, which makes it ideal for commercial use and home use too. Since it prints in Spanish, French and Portuguese also, the range of its utility stands broadened. One area where it needs improvement is weight, as it is heavier than a handheld label printer should be. Q. How do I print labels with higher quality using Brother P-Touch 550 Label Tapes? Click ‘Print’ from File Menu on P-Touch Editor. Click ‘Properties’ in the Print dialog box. Change the ‘Quality’ setting to ‘Give priority to print quality’. This change will return to the default value the next time you start P-touch Editor. Open ‘Printers / Printers and Faxes’ folder of Windows. Right click the printer driver for the printer. Select the ‘Printing Preferences’ menu. ‘Brother P-Touch 550 Printing Preferences’ dialog box will be displayed. Q. The Brother P-Touch 550 Label Tape is entangled in the machine or the top and base layers of the laminated tape are misaligned. What should I do? To avoid this, make sure that the underside of the tape cassette is completely touching the base of the compartment when installing the tape cassette. Also, make sure that the end of the Brother P-Touch 550 Label Tape is fed through the tape guides. Q. The labels often jams, when I print a large number of labels using the QL-550 paper guide. How can I avoid this? A. To avoid paper jams while printing a large number of labels using the QL-550 paper guide, remove the paper guide when printing more than 10 labels continuously and cutting each label automatically. Q. When I try to print a label, it comes out blank. What can be done in this case? A. This issue may occur when ‘Presets’ is set to anything saved for other printers than the QL-550 printer in the print dialog box. If so, please change it back to ‘Standard’ when using the printer. Q. How do I type an uppercase letter? A. To type an uppercase letter, enter the shift mode by pressing the ‘Shift’ key and type the letter. To type uppercase letters continuously, turn the caps mode ON by pressing the ‘Caps’ key. To exit the caps mode, press the ‘Caps’ key to turn Caps mode off. The Caps indicator will disappear. Q. How do I install or change the Brother P-Touch 550 Label Tapes? Press the ON or OFF button to turn the printer off. Hold the Brother P-Touch 550 Label Tapes Roll compartment cover at the sides near the front of the printer and firmly lift up to open the cover. Place the spool into the spool guides in the Roll compartment. Lift up the label lever and then thread the end of the Roll into the slot immediately before the cutter. 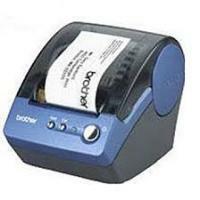 Lower the label lever and then close the Brother P-Touch 550 Label Tapes Roll compartment cover. Q. My machine has suddenly stopped printing. How can I resolve this issue? Open the ‘Printers / Printers and Faxes’ folder of Windows and check if your printer driver is shown as off-line. If it is off-line, close the print monitor screen and turn your printer power ON or OFF a few times. If this procedure is unable to make the printer driver go online and then restart the computer.